The UNESCO Mulu National Park is one of the highlights of any visit to Malaysia Borneo. 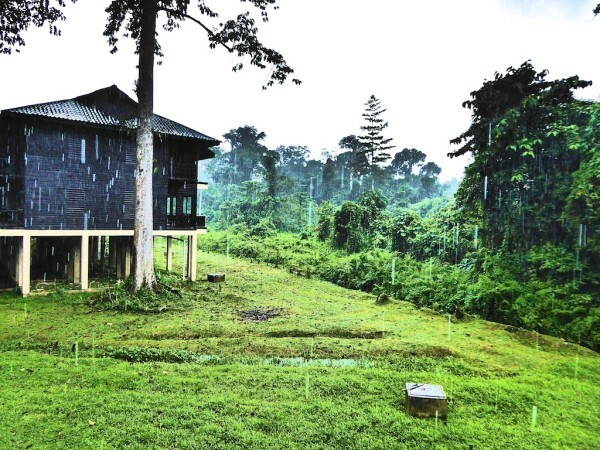 It has an abundance of activities like caving, jungle trekking and bird watching. 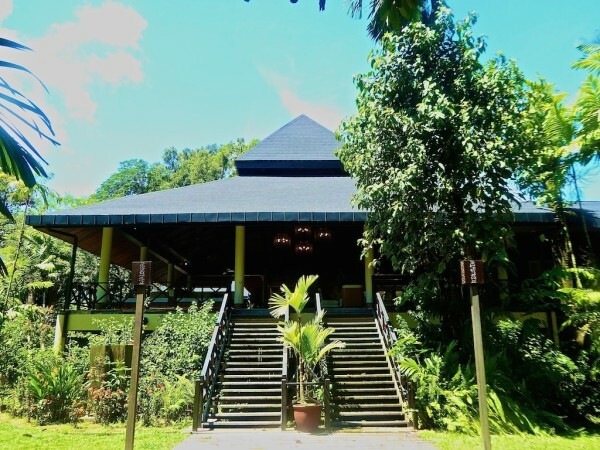 The Mulu Marriott Resort and Spa is a great base to stay in the heart of it all: a luxury base after a day’s hiking through the lush humid rainforest of the National Park. The plush bedding in our hut made for a great night’s sleep, coupled with the 5 star amenities you’d expect from the Marriott brand. 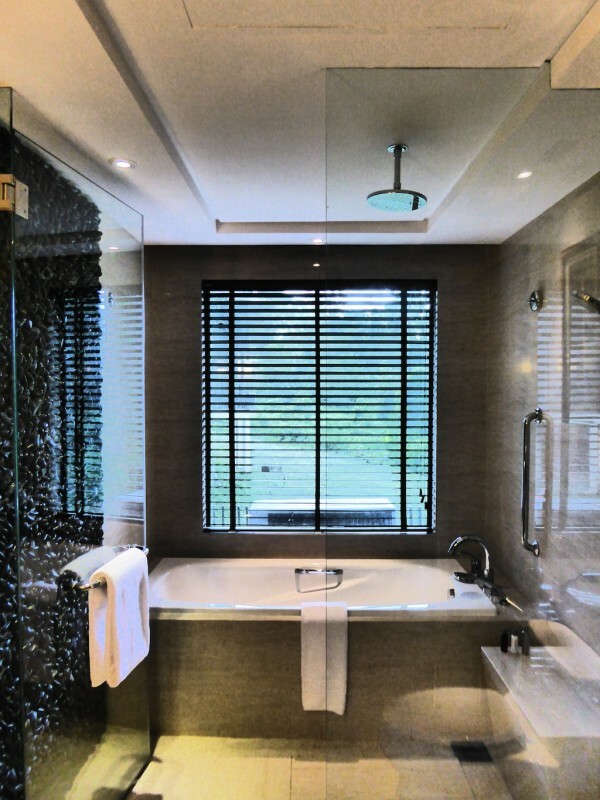 The contemporary design of the bathroom featured a high pressure walk in shower and a large bathtub to relax in. 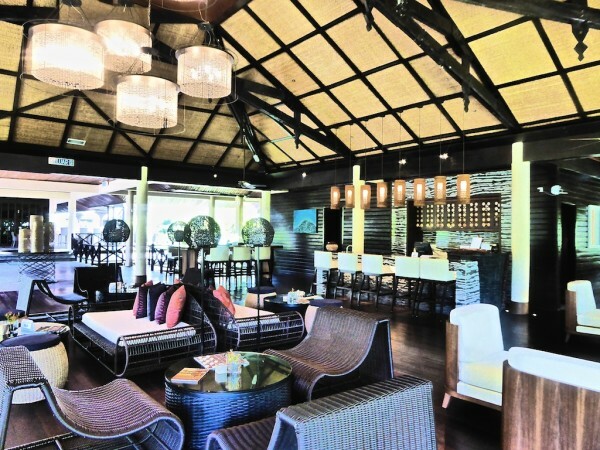 The lounge area is ideal for enjoying a drink at the in-house Riverbar after a day spent trekking in the jungle. The setting is stunning: surrounded by greenery, water and wildlife. WiFi and internet access generally in the Mulu area is almost non existent. However, free internet is available around the lounge area. It’s all about relaxation and serenity here. The Bali inspired Mandara Spa is on hand for massages and spa treatments and the outdoor swimming pool is a great place to chill and catch up on some reading. 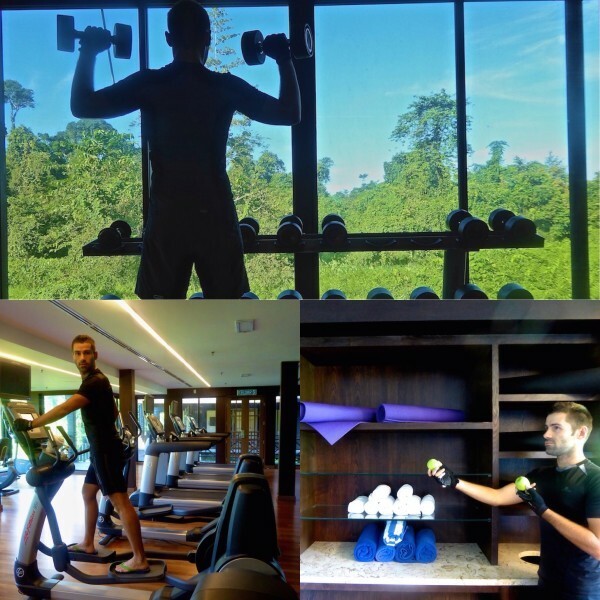 The gym is one of the largest we’ve encountered in our travels and has an array of cardio vascular machines, weights machines, free weights area and swiss balls. We loved using the gym and swimming pool in the morning to open up our tummies, ready for the large buffet breakfast. The Mulu Marriott is only 5 minutes away from the National Park and they provide a free shuttle for guests to/from the park entrance. 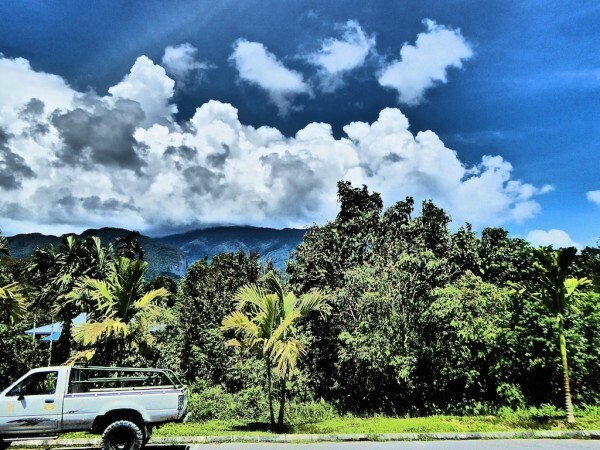 Most people who come to stay at Mulu Marriott are here to visit the park and explore the beautiful surroundings. The Mulu National Park has some of the biggest caves in the world. You can arrange cave activities directly with Mulu Marriott or you can also book your tours at the information center located at the entrance of the park. 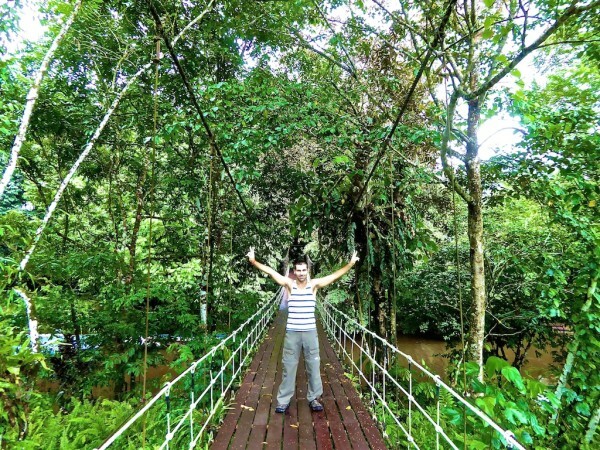 There is a discovery center and a few trails you can explore to learn about the Borneo rainforest. The Marriott café is where the meals are taken by guests with a choice of sitting indoors or outside by the pool. The breakfast buffet is damn good. Everything is cooked well with a variety of naughty treats to test the limits of your weight line. Well, considering you’re going to spend the majority of the day burning it all off trekking and caving in the National Park, we say why not? 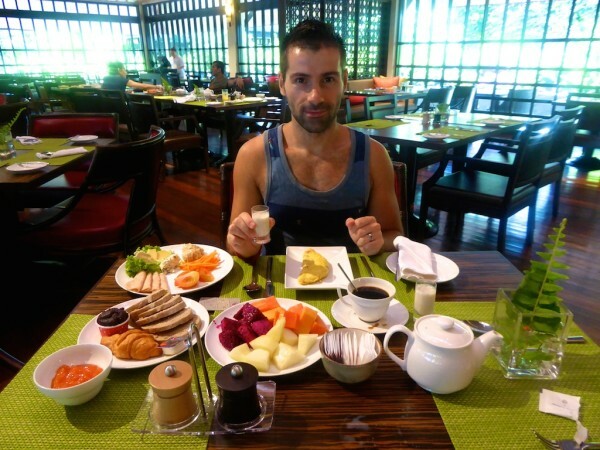 Yes Sebastien is going to eat all of this for his breakfast…and what of it? An excellent buffet dinner is also served at Marriott café featuring a wide variety of delicious local and international cuisine. 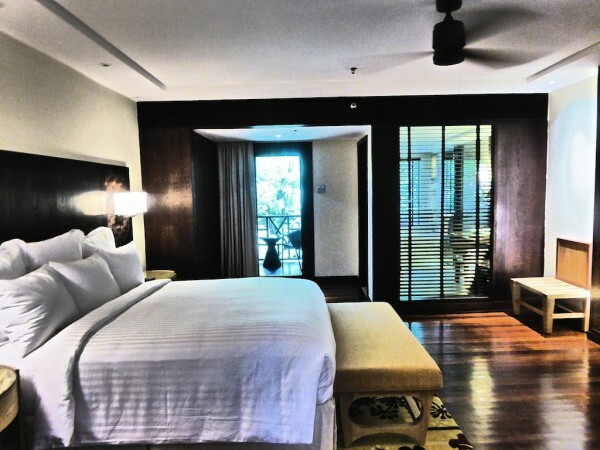 To book your stay at the luxurious Mulu Marriott Resort and Spa, visit Booking.com. Nice post! Looks like a terrific place to stay. Thanks for the comment Stephen. Have your travels taken you to Malaysia yet?